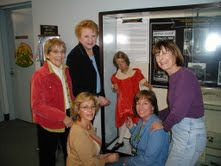 For Women's History month 2010, the Huntington Town Clerk's Archives has mounted an exhibit in Town Hall that highlights the activities of prominent women in Huntington over the years. This is a co-operative effort of the Huntington Town Clerk's Archives, the Huntington Historical Society and the Huntington Public Library. Among other artifacts that this exhibit features, is a girl's dress and a pair of vintage, 25" long, white kid gloves from Saks Fifth Avenue. One of many styles of ladies’ gloves of the times. These are only a few of the elegant pieces on loan to the Archives from the Huntington Historical Society. The exhibit will remain on display until the end of April 2010 and it is free of charge. Exhibit panels and cases are located in the lobby of Town Hall, across from the Town Clerk's Department, and on the third floor across from the Council Office.